Leading China Circular Knitting Machine Manufacturer, Supplier & Exporter, Xiamen Zhenlihua Industry & Trade Co., Ltd. was founded in 2000. After more than ten years' development, it has successively set up the sales and market service sites in Fujian, Zhejiang, Jiangsu, Guangdong and Shandong province in China. The company was committed to the researching, developing, producing and selling of Circular Knitting machines. Zhenlihua products range from Single Circular Knitting Machines, Double Circular Knitting Machines, Open Width Circular Knitting Machines, Single Mini Jacquard Knitting Machines, Double Mini Jacquard Knitting Machines and Single computerized jacquard knitting machines, Double computerized jacquard knitting machines, Knitting Machine Spare Parts, Knitting machine Accessories, Knitted Fabrics, etc. Zhenlihua circular knitting machine factory is situated in Xinglin Industrial Zone, Jimei District of Xiamen, which is the first industrial park approved by the State of Council for Taiwanese businessmen doing business in mainland. In the industrial park, there are a large number of Taiwanese enterprises with advanced machine-building industrial technology and strong technical forces in processing techniques, among which, Zhenlihua knitting machine machine is the remarkable one. Technology leads to the future and reform contributes to the progress. 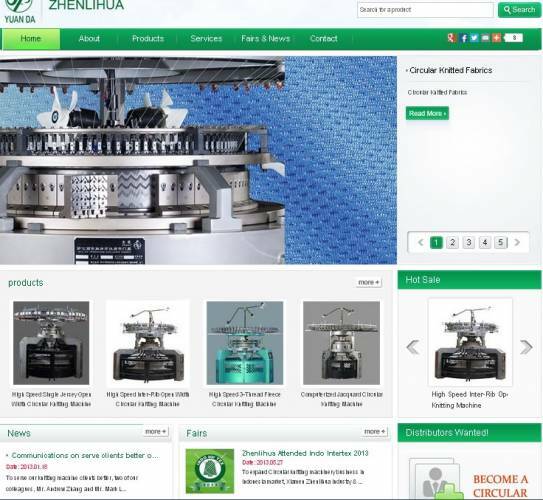 Now Zhenlihua company has developed into a modern circular knitting machine manufacturing company which deals with producing and trading with more than 12000 square meters' factory area. Through various technical cooperation with qualified Taiwanese enterprises and advanced foreign technology, product research and development level has been greatly upgraded. The advanced processing equipment includes imported CNC Machining Center, Horizontal Machining Center and Vertical Machining Center and so on and the annual production capacity is more than 800 sets circluar knitting machine.